I would like to start off my saying that I apologize in advance for the qualities of pictures in this post. I just don’t have a great space for pictures taking up large spaces so I had to make do. This means they may be a little blurry, a little shiny, let’s just pretend it’s artistic or something. Now that the apology is out of the way, I can say how excited I am about this order! It took a little while for the order to be fulfilled. I ordered it on January 1 and it was shipped on the 15. However, I received it on January 20 because I shipped EMS which means it was express! TesterKorea has a kind of permanent sale for members meaning that for their brand sale, all members get 30% off of everything. There was also a little bit of a deal with shipping so I took advantage of that. It ended up being somewhere between $50 and $60 for 86 masks so that is a great deal! It makes each mask less than a dollar which is nowhere near the price we have to pay in stores around here. Alrighty, let’s take a look at what I decided to pick up! 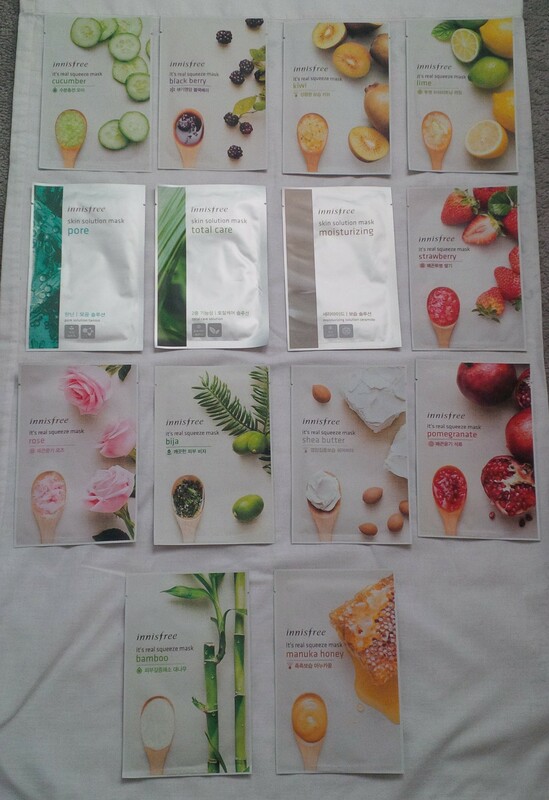 I grabbed a whole bunch of Innisfree masks. Let’s just work our way from left to right and top to bottom in this picture! Innisfree It’s Real Squeeze Mask Cucumber – Real Source Mask with fresh moisture squeezed from cucumbers to provide plentiful moisture to dry skin. Innisfree It’s Real Squeeze Mask Blackberry – Real Source Mask with moisture from squeezed blackberries that are full of nourishment to keep the skin healthy. Innisfree It’s Real Squeeze Mask Kiwi – Real Source Mask with refreshing moisture squeezed from kiwis for skin that’s smooth and clear. Innisfree It’s Real Squeeze Mask Lime – Real Source Mask with refreshing moisture squeezed from limes for skin that’s bright and clear. Innisfree Skin Solution Mask Pore – Unbleached, pure cotton mask with tannin to tighten the pores for intensive skin-firming and smoothing treatment. Innisfree Skin Solution Mask Total Care – Unbleached, pure cotton mask to treat complex skin problems, like dullness, sagging and wrinkles. Innisfree Skin Solution Mask Moisturizing – Unbleached, pure cotton mask with ceramides good at preventing moisture loss for intensive skin-moisturizing treatment. Innisfree It’s Real Squeeze Mask Strawberry – Real Source Mask with moisture from squeezed strawberries for skin that’s smooth and bright. Innisfree It’s Real Squeeze Mask Rose – Real Source Mask with fragrant moisture squeezed from rose that makes the skin smooth and glow. Innisfree It’s Real Squeeze Mask Bija – Real Source Mask to treat skin problems while keeping the skin moisturized, clean. Innisfree It’s Real Squeeze Mask Shea Butter – Real Source Mask with the incredible moisturizing capacity of shea butter to deliver moisture deep inside the dry, tight skin. Innisfree It’s Real Squeeze Mask Pomegranate – Real Source Mask with moisture from squeezed pomegranates for skin that’s firm and supple. Innisfree It’s Real Squeeze Mask Bamboo – Real Source Mask with bamboo extract to quench the thirst of the skin and keep the skin moisturized. Innisfree It’s Real Squeeze Mask Manuka Honey – Real Source Mask with nutrient-rich Manuka honey to moisturize dry, stiffened skin. Aritaum Fresh Essence Mask Honey – For elasticity and wrinkle care. Aritaum Fresh Essence Mask Cucumber – Soothes and hydrates skin. Aritaum Fresh Essence Mask Pearl – Creates smooth and bright skin. Nature Republic Real Nature Mask Sheet Bamboo – Bamboo extract reinforces the skin’s moisture balance. 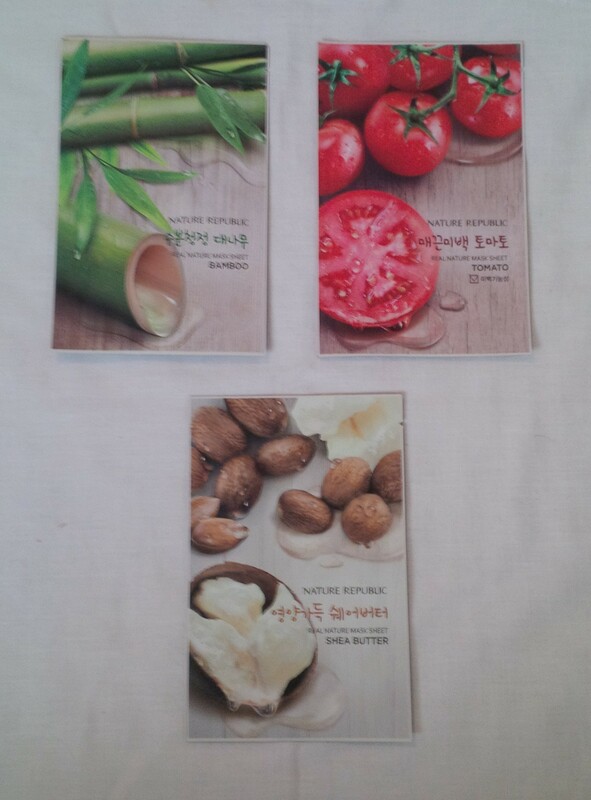 Nature Republic Real Nature Mask Sheet Tomato – Tomato extracts make moisturize and whiten skin. Nature Republic Real Nature Mask Sheet Shea Butter – Shea butter nourishes the skin with a luminous glow. The Face Shop Sparkling Apple Face Mask (10 Masks) – This face mask makes the skin clear and moisturized with sparkling water and apples that contain vitamins. 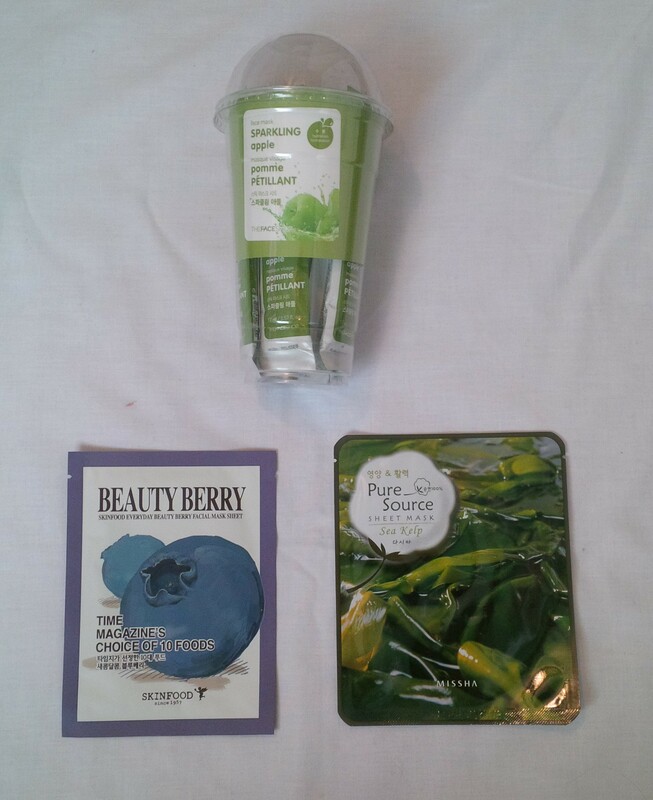 Skinfood Everyday Beauty Berry Facial Mask Sheet – A hydrating mask that contains blueberry extract, and helps prevent skin damage. Missha Pure Source Sheet Mask Sea Kelp – Pure cotton sheet mask enriched with Sea Kelp extract which contains mineral, vitamin and iodine, makes your rough and fatigued skin moisturized and vitalized while helping control wastes and impurities on the skin to make it clean and clear. Purederm Lemon – Purifying, refining and soothing. 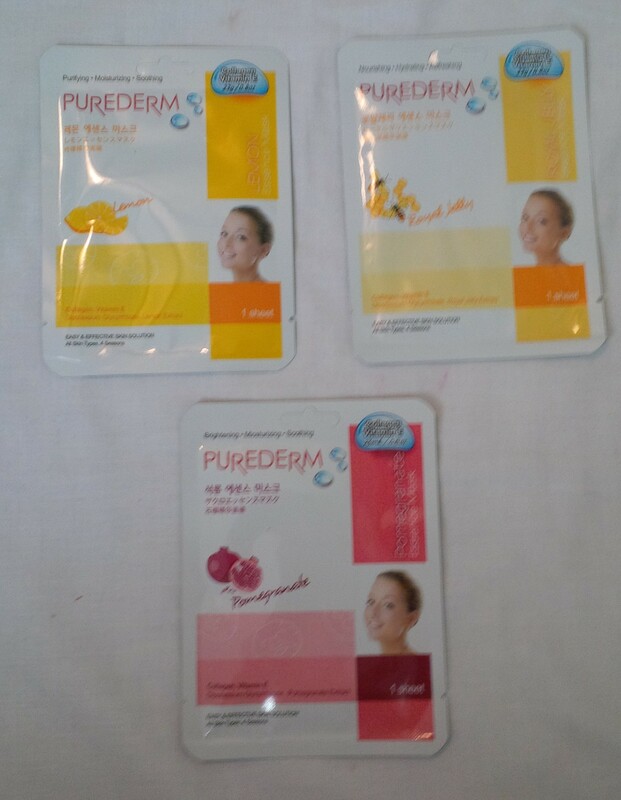 Purederm Royal Jelly – Nourishing and hydrating. Purederm Pomegranate – Brightening, tightening pores and moisturizing. Foodaholic Natural Essence Mask Green Tea – Contains the extract of green tea which soothes the skin and gives the moisture and refreshment to the skin to prevent the roughness and keep the moist skin. Foodaholic Natural Essence Mask Grain – Contains grain extract that supplies nutrition to your skin and prevents roughness and dryness on the skin to make it glow. Foodaholic Natural Essence Mask Cucumber – Supplies the moisture and nutrition to the skin and soothes and normalizes the skin. Foodaholic Natural Essence Mask Bamboo – Solves skin’s thirst and turns dry and rough skin into smooth and lustrous skin, soothing sensitive skin, by containing bamboo extract that’s full of moisture. Foodaholic Natural Essence Mask Royal Jelly – contains royal jelly extractions rich of diverse nutritions. This element creates a moisture-film, maintaining the skin wet and tight. Tonymoly Changing U Magic Foot Peeling Shoes (x2) – These peeling shoes designed for removing foot calluses help make the rough skin on your foot feel clean and smooth. These peeling shoes contain AHA extract obtained from apples, lemons, and grapes, which gently remove excessive calluses from your feet. It also contains aloe vera and rose hip oil, which moisturize and soothe your feet’s skin. The active ingredient of spring water helps relax your tired feet. Tonymoly Pureness 100 Hyaluronic Acid Mask Sheet – This gentle mask recharges skin with moisture. Tonymoly Pureness 100 Propolis Mask Sheet – This gentle mask instantly soothes skin. Tonymoly Pureness 100 Caviar Mask Sheet – This gentle mask provides rich nourishment to skin. 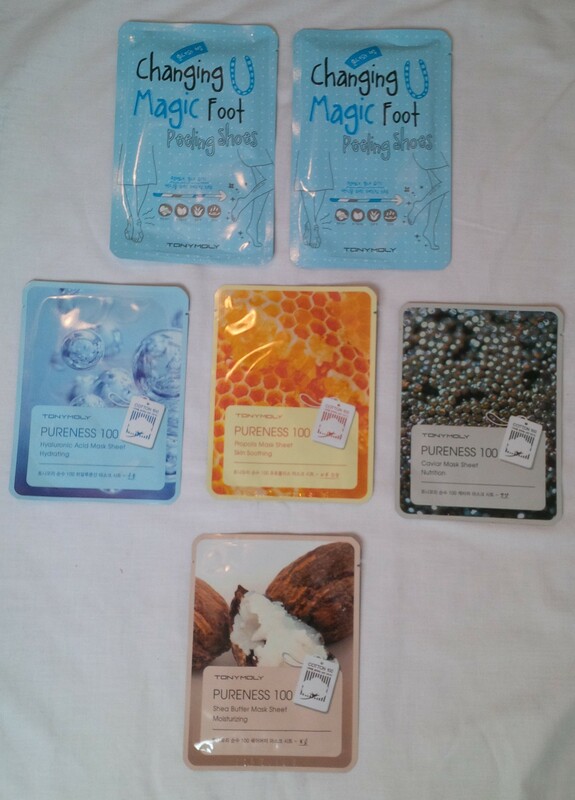 Tonymoly Pureness 100 Shea Butter Mask Sheet – This mask increases moisture in skin. 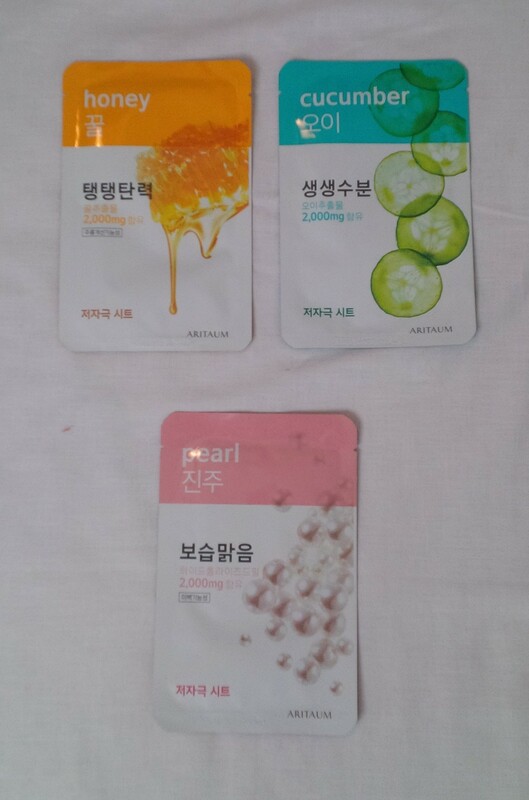 Etude House I Need You, Royal Jelly! Mask Sheet – This mask sheet contains richly nutritious Royal Jelly extract, helping to enhance smooth, moist healthy skin by protecting weak and rough skin from the outer environment. Etude House I Need You, Mango! Mask Sheet – This mask sheet contains mango extract known for its variety of vitamins and fibre, helping to provide firm and healthy skin with its sweet and gentle touch. Etude House I Need You, Honey! Mask Sheet – This mask sheet contains honey full of moisture, providing dry and rough skin with a moist, radiant look. Etude House I Need You, Lemon! Mask Sheet – This mask sheet contains Vitamin-C packed lemon extract, purifying dull and exhausted skin to become clear and transparent. Etude House I Need You, Coenzyme Q10! Mask Sheet – This mask contains Coenzyme Q10 that helps protect skin’s natural elasticity to enhance a firm complexion with a healthy glow. Etude House I Need You, Acai Berry! Mask Sheet – This mask sheet contains superfood Acai Berry extract, essential fatty acids and various vitamins, providing antioxidants to deliver young and healthy skin. Etude House I Need You, Rice! Mask Sheet – This mask sheet contains rice extract that brightens up dull and rough skin for smooth and healthy skin. Holika Holika Juicy Sheet Mask Tomato – Mask sheet containing tomato juice for firm up skin. 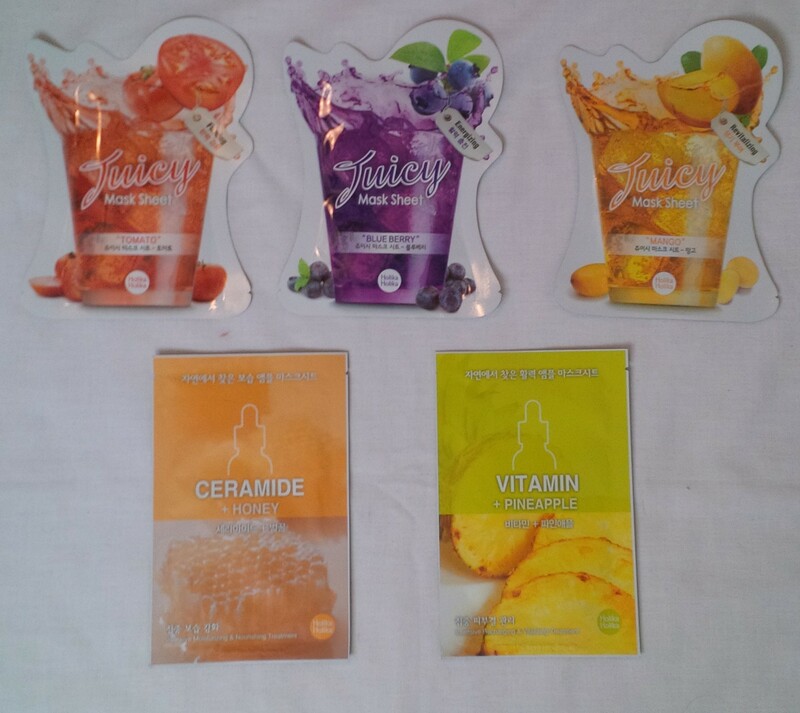 Holika Holika Juicy Sheet Mask Blueerry – Mask sheet containing blueberry juice for vibrant skin. 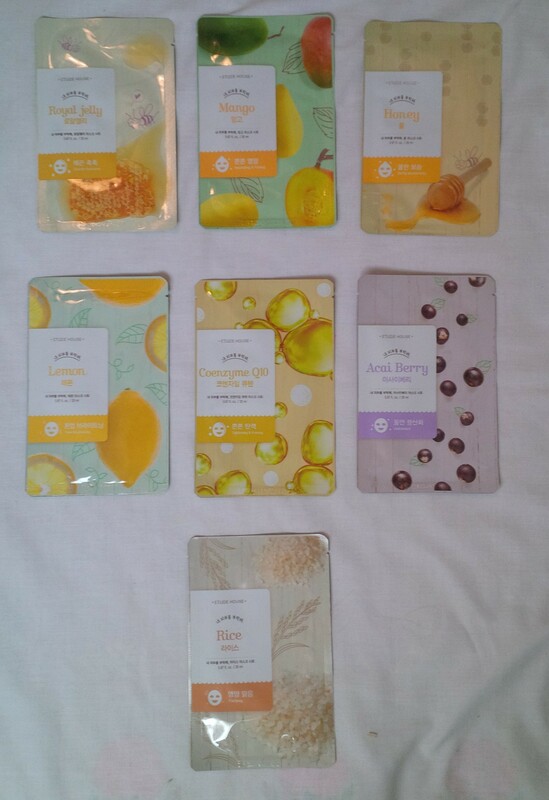 Holika Holika Juicy Sheet Mask Mango – Mask sheet containing mango juice for radiant skin that is full of vitality. Holika Holika Ceramide + Honey – Intensive moisturizing and nourishing treatment. Holika Holika Vitamin + Pineapple – Intensive recharging and vitalizing treatment. Mamonde 7 Days Project Moisturizing (Rose and Strawberry) – Offers deep hydration and nutrients to your skin. 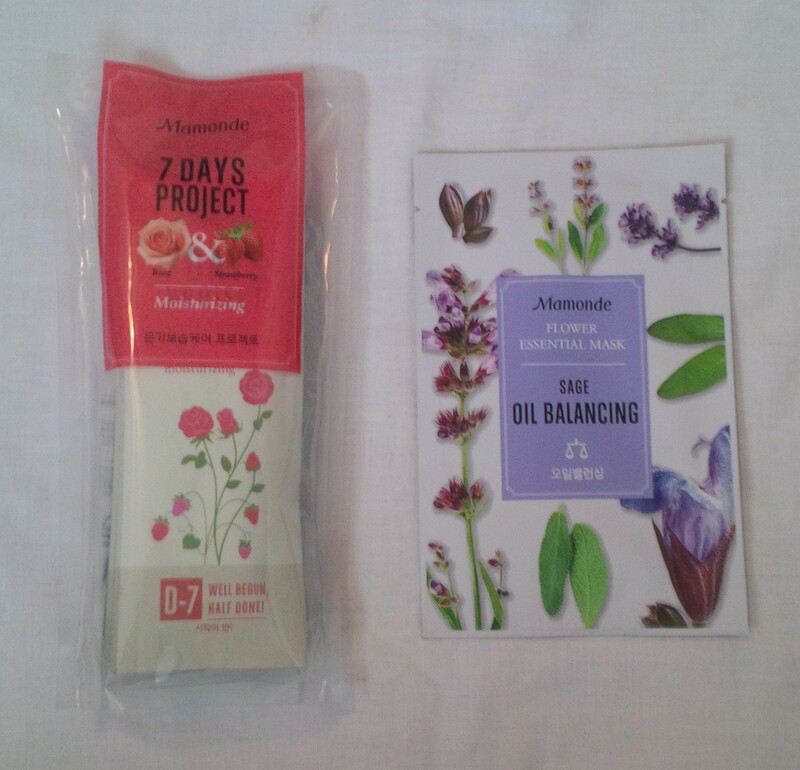 Mamonde Flower Essential Mask Sage – Oil balancing. 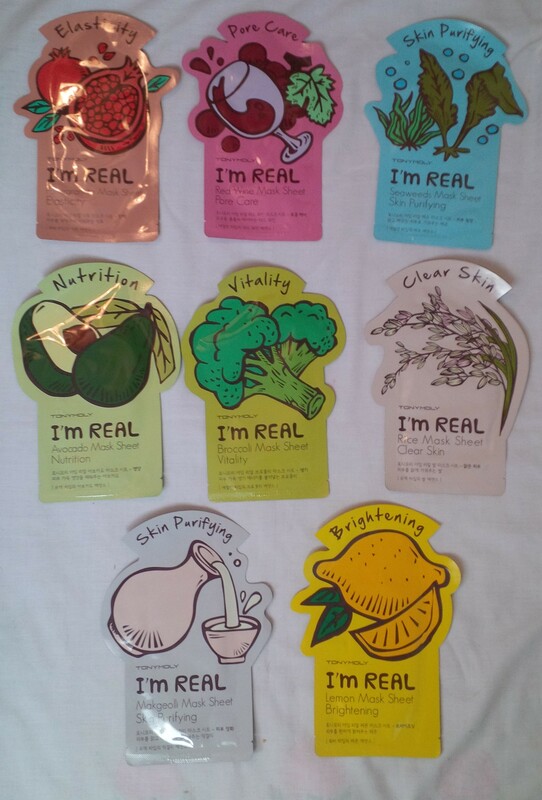 Tonymoly I’m Real Pomegranate Mask Sheet – Pomegranate mask firms up sagging skin. Tonymoly I’m Real Red Wine Mask Sheet – Red wine mask tightens uneven skin texture with enlarged pores. Tonymoly I’m Real Seaweeds Mask Sheet – Seaweeds mask makes skin look bright and radiant with freshness of the sea. Tonymoly I’m Real Avocado Mask Sheet – Avocado mask provides nutrition to the skin. 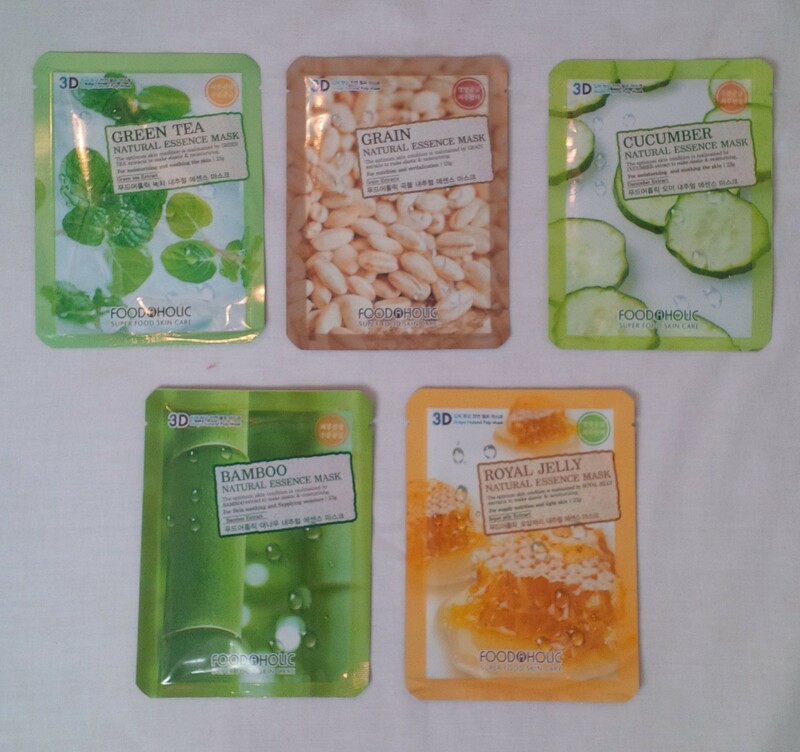 Tonymoly I’m Real Broccoli Mask Sheet – Broccoli mask provides vitalizing energy to tired skin. Tonymoly I’m Real Rice Mask Sheet – Rice mask makes dull skin look radiant and glowing. Tonymoly I’m Real Makgeolli Mask Sheet – Makgeolli mask makes uneven skin tone look radiant and glowing. Tonymoly I’m Real Lemon Mask Sheet – Lemon mask makes dull and dark skin look radiant. Tonymoly Good Luck Mask Sheet – The mask sheet delivers moisture and elasticity deep into dry and taut skin with shea butter and collagen. Tonymoly Thank You Mask Sheet – The nourishing mask delivers rich moisture deep into dry and taut skin with shea butter. Tonymoly Share It Mask Sheet – The mask sheet provides moisture to the dry skin while strength the damaged surface with shea butter and snail extract. Tonymoly Be Happy Mask Sheet – The mask sheet provides rich moisture to the dry skin with shea butter and hyaluronic acid. Tonymoly Love You Mask Sheet – The mask sheet for sensitive skin soothes by providing nourishment to the dry and taut skin with shea butter and aloe vera. Tonymoly Changing U Magic Mask Black Pearl – Brightening mask sheet with black pearl. 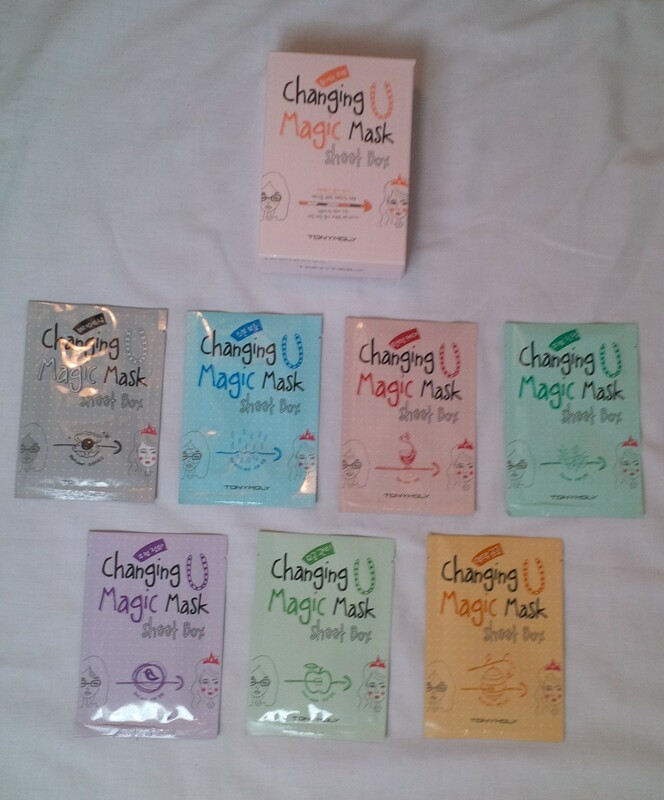 Tonymoly Changing U Magic Mask Hyaluronic Acid – Moisture mask sheet with hyaluronic acid. 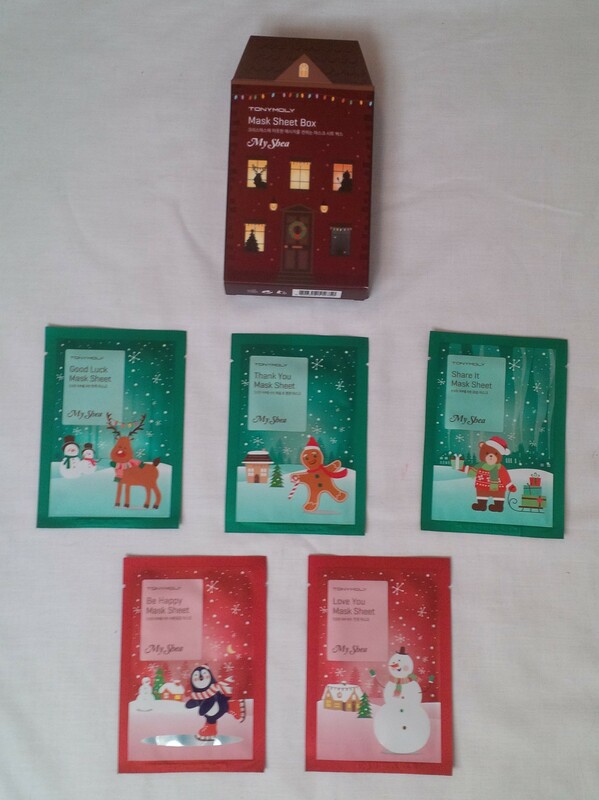 Tonymoly Changing U Magic Mask Red Wine – Firming mask sheet with red wine. Tonymoly Changing U Magic Mask Tea Tree – Skin soothing mask sheet with tea tree. Tonymoly Changing U Magic Mask Bird Nest – Skin purifying mask sheet with bird nest. Tonymoly Changing U Magic Mask Green Apple – Pore mask sheet with green apple. Tonymoly Changing U Magic Mask Royal Jelly – Nutrition mask sheet with royal jelly. TesterKorea is pretty known for the samples that they give out with their orders. I was pretty excited to see what I would get, especially because my order was so large. Some people had said lately that because of a sale they had, they had just been giving people like 20 samples of the same product so I wasn’t sure what to expect. I didn’t actually get any samples with my order but did get a full size Nature Republic Fly to the Moon Liquid Eyeliner in Black. I haven’t swatched it yet because I have a couple liquid eyeliners on the go at the moment. I am pretty happy with this! Anything that is given for free is a bonus so I definitely couldn’t be disappointed! Disclaimer: All pictures and opinions are honest and my own. This order was purchased with my own money. Product descriptions taken from product packaging. 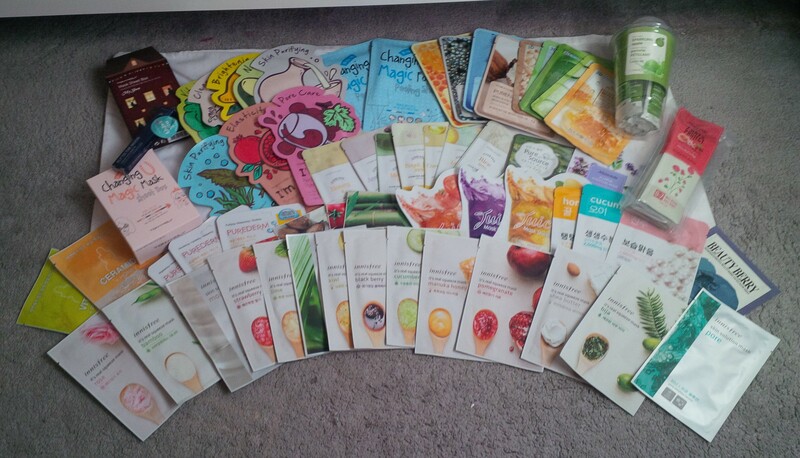 So many sheet masks! They look awesome. I always see those Etude House masks in hauls, I really need to try them out. Wow, I’m jealous! It’s always fun trying out new masks. =) Hope you enjoy them all! Haha yea I realized after I bought them all that I may have jumped the gun a little bit. I may never run out of masks at this rate but I just love them so much! Have you found a favourite kind of mask yet?